In the largest deal of 2016 (so far), after months of negotiations with several baby steps agriculture giants Bayer and Monsanto announced that they are planning to merge. In an all-cash transaction Bayer striking the deal a $128 a share valuing Monsanto at $66B. including the debt. Consolidation has been driven by a global glut that has pushed down crop prices and hurt farm incomes, leading to reduced investment in agricultural inputs such as fertilisers and Agrochemicals. Several Mega & small mergers are right now underway/partially completed like Dow Chemical and DuPont, ChemChina & Syngenta, FMC & Cheminova etc. 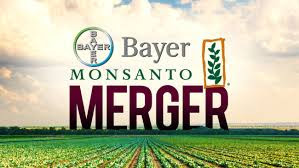 But the proposed merger likely face an intense and lengthy regulatory process If the deal closes, it will create a company commanding more than a quarter of the combined world market for seeds and pesticides in the fast-consolidating farm supplies industry. Both the company executives claims the businesses are complimentary & there is very little overlap between them. However antitrust experts have said regulators likely demand the sale of some soybeans, cotton and canola seed assets.